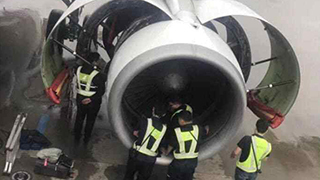 Chinese airline Lucky Air is reportedly pressing charges against a passenger who threw coins at an aircraft engine ahead of a recent flight for "good luck." The man's actions allegedly caused roughly US$21,000 in damages and delayed travel plans for 160-plus passengers, who were forced to wait until the following day to fly out. Officials at Anqing Tianzhushan Airport were shocked to find two one yuan coins on the ground near the left engine of a Lucky Air plane. Small coins could cause great damage or total engine failure if they are sucked into an aircraft's engine. Soon after the officials saw the coins, a 28-year-old man, identified only by his surname, Lu, admitted to tossing them at the plane's engine as he boarded the aircraft for flight 8L9960, as per the South China Morning Post. According to the outlet, Lu threw the money at the aircraft for "luck." He had already chosen Lucky Air, but apparently needed more. The flight was quickly cancelled over safety concerns. Meanwhile, Lu, who was travelling with his wife and child, is said to have been detained for seven days in relation to the offence. "The incident caused a direct economic loss of nearly 140,000 yuan, and our company will press charges against the passenger in accordance with the law," reps for Lucky Air said in a statement. "Not only does tossing coins not give you good luck it will endanger aviation safety and land you in detention. You could be fined and prosecuted."